Council chiefs are reminding voters of the work they do, using images including a drunk girl vomiting in the street and a dog fouling a park. Research by the Local Government Association found residents in England and Wales were satisfied with services but did not realise who provided them. 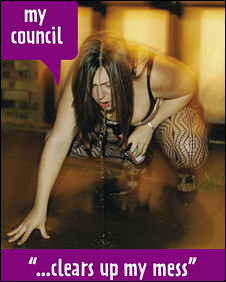 It is giving councils posters to counter what it says is an unfairly poor public perception. It hopes they will help educate people on what their council tax is spent on. Most people did not realise dog wardens, swimming lessons, tourism promotion or restaurant food safety were all part of the local authority's role, the survey found. Most wrongly thought the police and hospitals were under town hall control. LGA chairman Sir Simon Milton said most people thought the council just collected the bins. "They haven't the faintest clue of the vast range of services that town halls provide. "From archaeology to zoology, from cradle to grave, councils provide over 800 services to improve people's lives and help them get safe and sound through the day." He said people were "overwhelmingly positive" when asked about things like leisure centres or parks. "And yet people are resoundingly negative about the organisation that provides these services. "The real problem is that people don't link back the services they get to their local council and question whether they get value for money for their council tax." He said the posters were designed to get people to appreciate that their town hall did "a massive amount" with council taxpayers' money, from policing standards in restaurants to clearing up vomit on the streets.